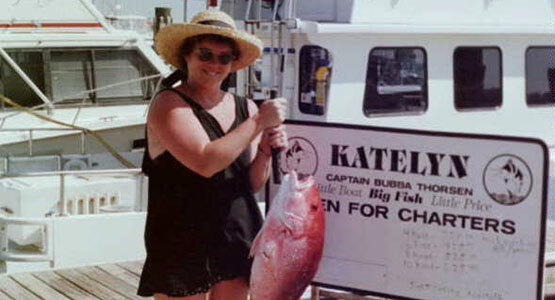 Come fish the beautiful Gulf of Mexico with Captain Bubba Thorsen on the Charter Boat Chulamar or Charter Boat Katelyn. Docked just minutes from the emerald waters off Pensacola Beach, these two vessels can put you on the fish quickly. Bottom fish for snapper and grouper. Troll for King Mackerel and Cobia. Go all out for Yellow Fin Tuna. For divers and sightseers we have packages to suit your needs too! We are the oldest walk on boat in the Pensacola fl. We have been doing walk on trips longer than any boat in the Pensacola area. We do few private charters. some boats fill in with walk ons. If they do not have a private trip they run a walk on. The phrase walk on, does not mean you just walk on, you still must have reservations. the real meaning of walk on is that you go with other passengers, other passengers may have one in there group or 10 in there group. You make reservations a couple of days or even a week before the trip departure date. All charter boats have a min. number of people they must have to go fishing, Dont think they are going to go with 2 passengers, get real. You call in around 5:00Pm the evening before the trip and check in, if the weather is bad or we did not get the min we have to cancel and hopefully get you on another day.We do no private trips between Memorial day and labor day, because people coming down for there walk on trips are counting on us. We do everything by phone only, Capt. Bubba Thorsen is old school, I like to here your voice.We specialize in walk on or party boat fishing. You make a reservations with a credit card, we do not charge the credit card at that time. We hold it with the credit card, people in groups like to pay separately or 2 may pay together or 1 pay whatever. We do charge the credit card if you tell us 6 in the party and 5 show up. Then the card is charged for the No show passenger. you made the reservation on your card. It is best to let your friends make there on reservations. We take everything but, No Personel Checks. The average number of walk ons in the summer is 20. The min number is anywhere from 10 to 12, depending on the price of fuel that day or if we have people that can only go this day or the next we are going to work on getting them out. 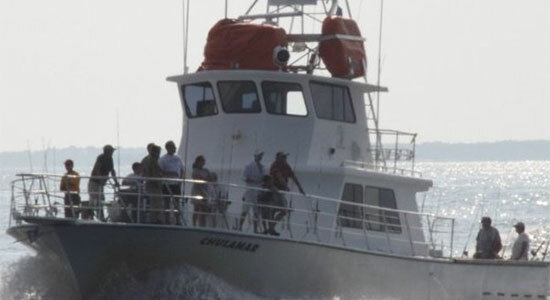 The Charter Boat Chulamar was custom built in 1995 in Wetumpka, Alabama. She is the biggest charter boat on Pensacola Beach and in Pensacola, Florida. The Katelyn is a 26 foot custom built Charter Boat. She was custom built by Capt. Bubba Thorsen and his son Richard Thorsen. Check our full range of services and their respective prices. All Prices and trips are from Dock to dock. I just want to let you know that I had a great time on Friday the 13th. We went with you on the Chulamar and we caught plenty of fish. I just want to thank you and your crew, and if we come back next year for the Gulf Breeze Classic Baseball tourney we will be looking you up again. By the way tell Chris that we won second in the tournament and he was excellent. © 2019 Captain Bubba. All rights reserved. Website by Zealopers.